The space rock hit at a staggering speed of 37,900 mph (61,000 km/h), gouging out a new crater roughly 131 feet (40 meters) wide in an ancient lava-filled lunar basin known as Mare Nubium, Madiedo and colleagues said. The scientists think the boulder behind the crash was about 880 lbs. (400 kg) and measured between 2 and 4.5 feet (0.6 and 1.4 meters) in diameter. If a space rock this size hit the Earth, it might create some spectacular fireball meteors, but it likely would not pose a threat to people on the ground, researchers explained. 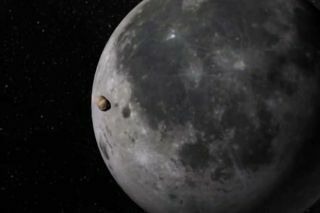 But the moon lacks an atmosphere like the one enshrouding our planet, making it quite vulnerable to incoming asteroids. The energy released by the September 2013 impact was comparable to an explosion of roughly 15 tons of TNT. It was at least three times more powerful than the largest previously observed event — a powerful lunar explosion spotted by NASA scientists on March 17, 2013. During that crash, a space rock hit at an estimated 56,000 mph (90,000 km/h), carving a new crater 65 feet (20 meters) wide. Typically, the flashes from these impacts last only a fraction of a second, but the bright spot seen by Madiedo glowed for eight seconds, making it the longest observed impact flash. Since 2005, NASA's moon impact-monitoring program has observed more than 300 meteorite strikes on the lunar surface. The research on the September 2013 lunar impact was unveiled Sunday (Feb. 23) in the journal Monthly Notices of the Royal Astronomical Society.